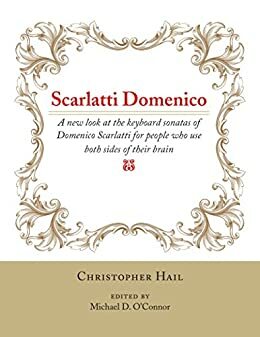 Protean Press is proud to announce the publication of Scarlatti Domenico: A New Look at the Sonatas of Domenico Scarlatti for People Who Use Both Sides of their Brain, written by Christopher Hail and edited by Michael D. O'Connor. The book is currently available in eBook format via Amazon.com. In 2007, Christopher Hail began to contribute to the scholarly research on the work of Domenico Scarlatti by authoring an erudite, witty, and successful website dedicated to the Italian composer. He contributed to it daily, until his death in 2014. Given the relevance of Hail's research, his family estate resolved to publish the content of the website in permanent book form to make it available to musicians, scholars, and music and university libraries. As a career librarian at Harvard University, Hail recognized the challenges confronting scholars. He used his professional skills to create a thorough and reliable reference book — in his own words, "an attempt to integrate all the various new collections and research into a comprehensive resource for people seriously interested in studying Scarlatti." Hail's work offers new solutions to many of the perplexing problems scholars and musicians encounter in the study of the sonatas of Domenico Scarlatti. Each piece is discussed from a historical, analytical, and musicological point of view, substantially adding to the already monumental work on the composer conducted by Ralph Kirkpatrick and many others. For whom did Scarlatti compose the sonatas? When did he compose them? Did he compile them in major collections himself? Were they merely teaching tools, or did they serve a serious artistic purpose? As an accomplished pianist, Hail played a Scarlatti sonata daily, just as the composer’s most illustrious pupil, the Queen Consort of Spain Maria Barbara di Braganza, apparently did. He also believed that, along with his 1685 contemporaries Bach and Handel, Scarlatti belongs in the Pantheon of the immortals of music. And it was his involvement on a deep intellectual and emotional level in his lifelong engagement with the life and work of Domenico Scarlatti that makes this volume perhaps the most significant contribution to Scarlatti scholarship since Kirkpatrick’s celebrated research over half a century ago. The research and writings of Christopher Hail, first published as a website and now available in eBook format, offer new solutions to many of the perplexing problems scholars and musicians encounter in the study of sonatas of Domenico Scarlatti. Each piece is discussed from a historical, analytical, and musicological point of view in this witty, erudite volume, which substantially adds to the already monumental work on the composer by Ralph Kirkpatrick and many others. Learn more and purchase the eBook here.